One of the more popular features on social networking sites like MySpace and Facebook is the ability to send people a virtual gift - flowers, a drink, whatever. Apprema has a way to send real gifts to your friends throught social networks or email. They can be personalized, come with virtual "wrapping" (including designed packaging and your photo) and can range from music downloads to Starbucks gift certificates. 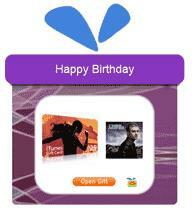 For example, you could send an iTunes gift card with your personal recommendation as to what to download. They don't have to take your suggestion and can download whatever they want but this way, it's a little more personal. There are also group options. You can set up a gift for someone and ask others in your group to contribute. Apprema has a system that handles email reminders, payment tracking for each individual and so on, so you're not running people down looking for their five bucks. In these days of social networking and the constant birthday reminders, etc., this isn't a bad way to take care of shopping for your friends. It's also a pretty good way to offer clients gifts in appreciation for their patronage, or even as a way to offer rewards for their loyalty to your networks. And for merchants, you can contact Apprema to make your gift cards or products available through Apprema - a good way to get your business active in the social networking world.